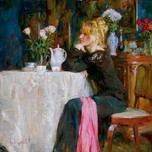 Husband and wife team Michael and Inessa Garmash are considered two of the finest Romantic Impressionists of our day. Both were born in Russia, where they eventually studied art. 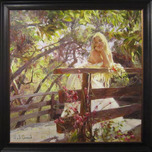 An early starter, Michael Garmash began paintings at the age of three. By age six, he had started his formal education at the Lugansk Youth Creative Center. Recognizing rare, natural talent, his teachers sent his works to a variety of exhibitions in the then Soviet Union. Inessa Garmash, born Inessa Kitaichik, has excelled in the arts since early childhood. She entered the Lugansk Fine Art School at age fifteen. At seventeen she was accepted as that year's best undergraduate to the Lugansk State Fine Art School. The Garmashes began their artistic collaboration when Inessa, after seeing the damage their toddler had done to her to one of her husband's paintings and not wanting him to be upset, fixed it herself. Michael then submitted the painting for review and was praised for completing his best work ever. He was surprised to see the "new" painting, and immediately recognized his wife's hand. 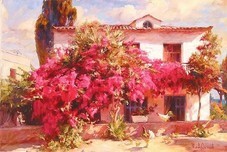 Michael and Inessa Garmash have painted together every since.